I had the luck of being around computers at the age when my most-spoken word was “Why?” I had a Cool Uncle, and among the attractions at his house (swimming pool, ATVs, frisbee-catching dogs, an industrial lawnmower) was my Cool Uncle’s small business and hobby: building PCs. Every Christmas, Thanksgiving, or non-holiday visit to his house, my cousins and I scrambled into his basement to take in the landscape of electronics. It was more of a morgue, actually: the bones of dead PCs lay in the open, so they might be set into the gestating, new PCs beside them. I don’t think any of the PCs had case panels on them. My cousins and I would speculate at how many megahertz were inside a processor. We’d poke at capacitors. We’d marvel at how a serial cable made it possible for two people to play in the same Quake game together, their CRTs back to back. It was a kind of technological ruin to us. If kids digging through the expensive guts of 386s and Pentium IIs annoyed my uncle, he hid it from us. Formative gaming stories like mine aren’t unique. I think everyone who’s passionate about gaming can point to how they fell into it and how much it meant to them. But I do think that being exposed to PC building at a young age improves our relationship with the stuff we play. Seeing CPUs, RAM, hard drives, and cables strewn out in the open instilled me with the idea that the beige boxes that make games happen aren’t fragile, sacred things. Those boxes shouldn’t be sealed shut—you’re meant to put your hands in there and do surgery. Throwing a piece of technology away was a wasteful crime—why do that when you could use its parts to build a PC that could operate as a server, or a rig that your neighbor could use? I didn’t know it then, but being exposed to PC building rid me of the notion that gaming was about consumerism, that it was about how many products I could bring home from Best Buy and stack up to impress my friends. Gaming wasn’t about accumulating products: it was a hobby and craft, a context to express yourself with different tools. And like owning a pet, it’s a craft that comes with responsibilities. I had to clean my PC to keep it happy. When my PC was unhealthy, I literally had to listen to its whimpering, in the form of motherboard beeps, to diagnose why it was sad. Gamers have a long history of arguing that their platform is the best. But however persuasive your forum post, what I think really, meaningfully distinguishes PC gaming from other platforms is its transparency. When your Contra cartridge didn’t work for your NES, even if your parents were electrical engineers your only recourse was superstition. When your Xbox 360 inevitably red-ringed, you had to send it on a vacation to Narnia to get it fixed. Consoles deny their owners the opportunity to build a relationship with the hardware itself. That relationship takes on new meaning as you age. 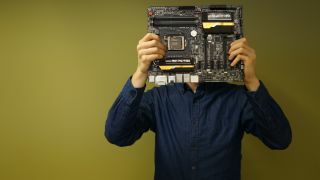 Shopping for your own parts encourages you to do thorough research on which graphics card will have the best lifespan or which monitor specs actually matter—good practice for scary adult milestones like buying a car or home. Swapping out your own parts, doing your own troubleshooting, however frustrating, instills you with the idea that taking the time to research and problem solve might be time-consuming initially, but the knowledge and attitude you earn from it is invaluable. I’ve learned to embrace the headaches naturally come with homemade technology as opportunities to engage with my hobby, and maybe even become a better person in the process. Han Solo is a great pilot not because he bought the best ship in the universe, but because he knows exactly how the Millennium Falcon fits together, and just where to kick it when the engine sputters.